Share the post "Driving a Tesla Car with Mind-Controlling"
The Tesla Model S has gone few meters, in a straight line between two spots in a parking garage. The interesting thing was that there was no driver behind the wheel. There was a person in the passenger’s seat who put a EEG headset which allowed him to control the car with his mind. Let me introduce the `Teslapathic car` to you. 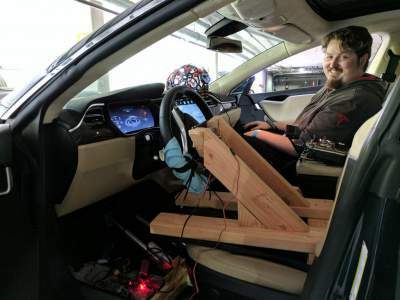 A team of successful scientists located in California used 2015 Tesla Model S 85D for a project to be placed in a Hackers event. The team of scientists used EEG headsets. EEG which is `Electroencephalography` is an electrophysiological monitoring method to record electrical activity of the brain. According to team`s project description, those EEG headsets are put on the driver`s head and it translates the brain activity for “stop” or “go” into analog signals by an off-the-shelf RC radio and articulated actuators on the pedals and a motor on the steering wheel. In this point, a machine learning program converts the brain reactions into commands. Developers of this project creates special gestures for it. For example, to start the engine and move the car, the passenger in the backseat with EEG headset tap his right foot. Additionally, if he wants to stop the car, he clenches his left hand. 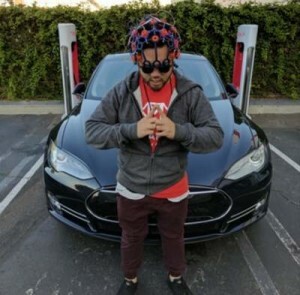 Actually, the driver sends analog signals to his brain which converts those to commands connected to the car electronically. Moving and stopping are developed as brain controlled but what about steering? Well, steering was somewhat bulky, and unfortunately not brain-controlled. The team built in a windshield wiper motor fitted with a potentiometer on the steering wheel. A head-mounted gyro for the driver allowed some steering ability thus when the driver moved his head right or left, the steering wheel reacted accordingly. The developer team also planned about safety of the driver. While developing the tool for mind-controlling, they created an emergency break code, in the event of a failure. So the driver should hold a dead man’s switch to send a signal to stop the car. Maybe mind control will have a future in the automotive industry?